When I lived in New Zealand, I decided to buy myself a car that had some potential to be a light & fast 'round town transport. 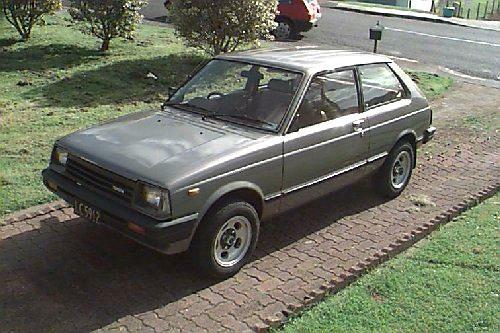 I settled on a Toyota Starlet, and found a very nice 1984 model in my local area. 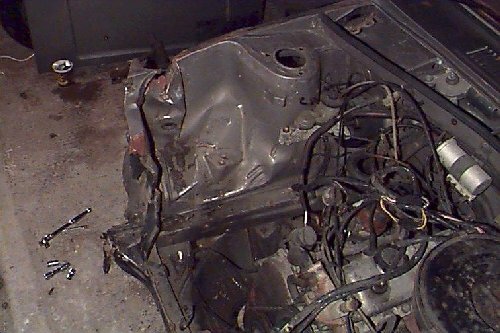 I brought the car back to Australia with me in early January 1999 and for various reasons work has not started on it until early 2001. 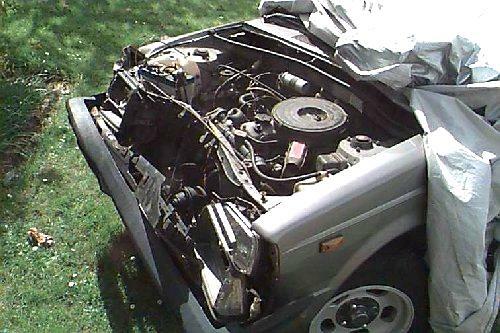 I'll be adding a 4AFE 1.6 litre twin cam to it that has been modified to make about 240hp. The Starlet only weighs about 780kgs, and so it'll certainly be a fast little 'round town car. I'm also going to be adding some much bigger disc brakes on all four corners to help it stop, as the factory brakes are rather small. 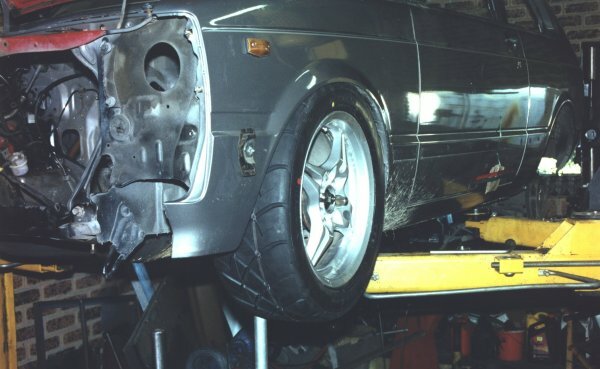 The rear end will be fitted with a Toyota Celica RA-45 LSD disc brake differential that I also picked up in New Zealand. 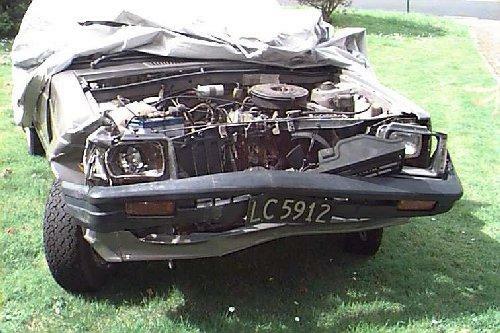 This is the car a day or so after I picked it up in Auckland. Possibly the tidiest and least rusty Starlet I've ever seen. 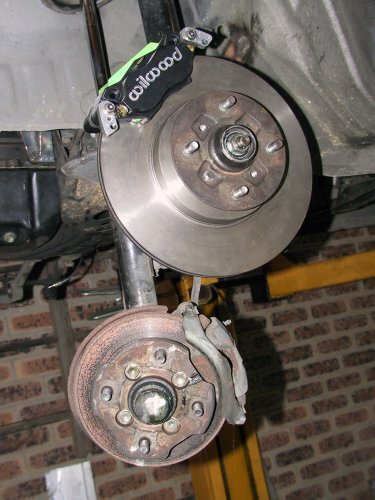 The brakes are the same. 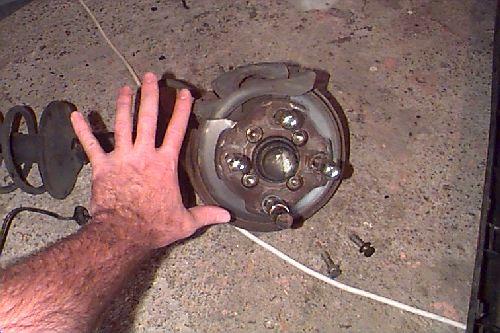 In the picture you can see my hand next to the front brake disc. My hand is very nearly bigger than the disc! 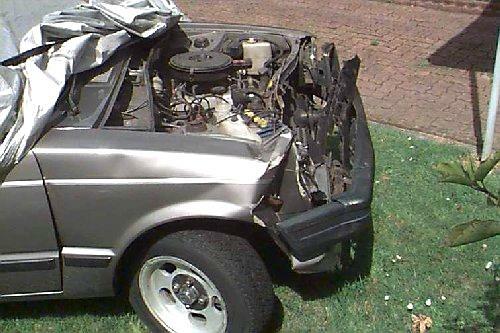 The first pic shows the front right hand corner of the car, and apart from some crumpled panels, this was the worst of the damage. 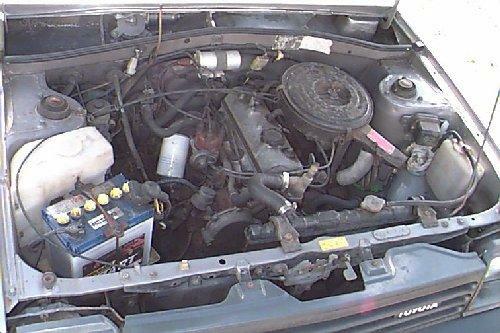 I changed the engine bay panel with a good one from another car. 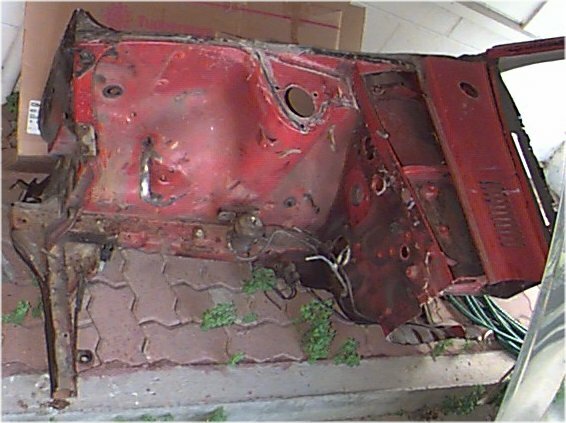 The third pic is from from where the driver's side front wheel would be - if it was there - towards the engine bay panel. You can see a few creases and ripples here and there. The plastic pipe is the rear window washer water line that comes from the water bottle. This pic shows the front cut of the donor car. I had yet to pick out all the spot welds in this section. Here's a couple of pics of the car after it arrived in Australia. Whew! Darn glad to see that it arrived ok, and as you can see it's ended up being pretty straight again, and I've got a brand new front-right hand mudguard for it. The rest of the panels will paint up as good as it looked before. 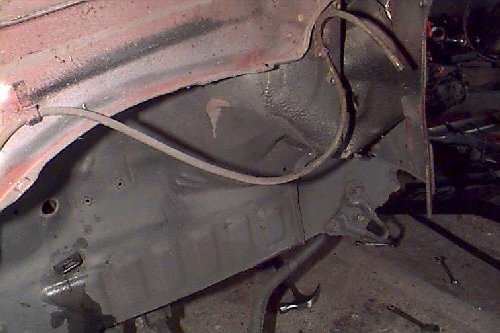 I'll be adding a few pics of the repair of the car as time goes by, and also when I start the modifications to add the 4AGE twin cam and disc brake LSD rear end to it. 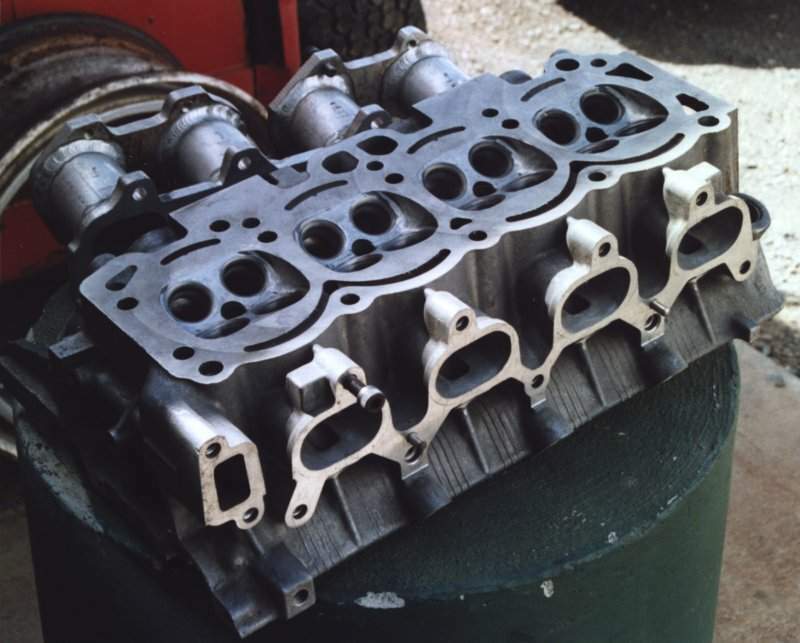 The new 4AGE engine is well under way now, and the head is basically finished. Here's some pictures of it. 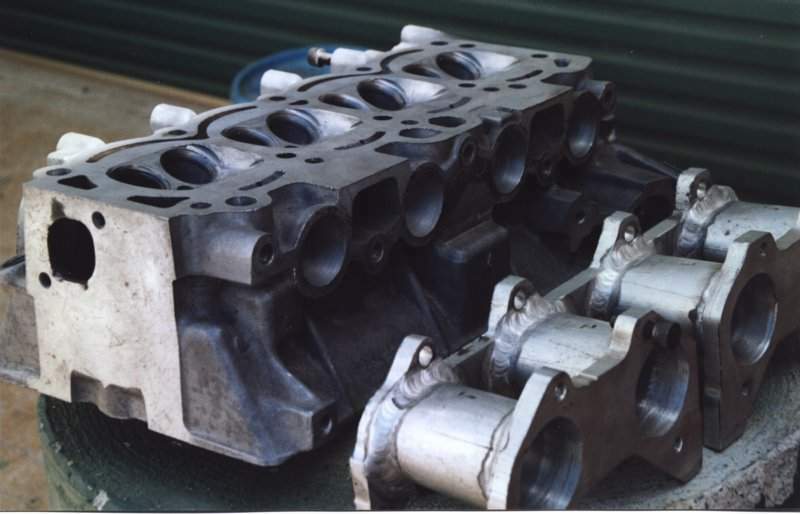 A rather nice porting job done there, by my good friend Adrian, the ex-Repco Brabham Formula One engineer. Progress is finally happening, with the 4AGE engine and T-50 gearbox getting mounts, and the 6.7" diff also finished being fitted. Doing the virtually all of the fabrication work is a friend of mine, Adrian Brooke, who used to work in the late 60's as a Repco-Brabham F1 engineer. 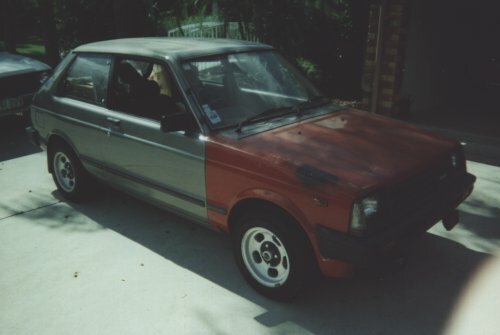 Above is the car as of mid 2001. 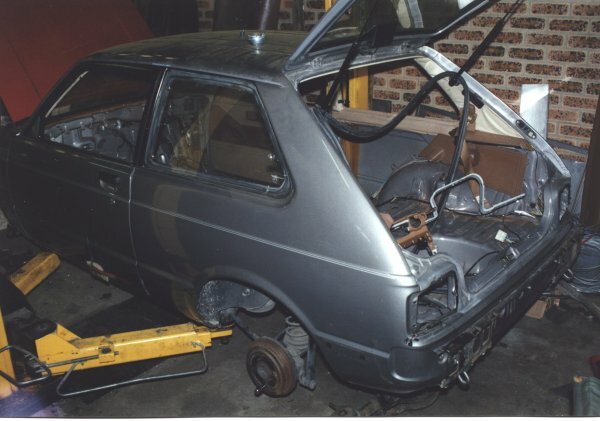 You can see the 4AGE sitting in the engine bay, the interior gutted, and in the right hand picture the front left-hand wheel & tyre being test fitted for ride height and guard clearance, etc. 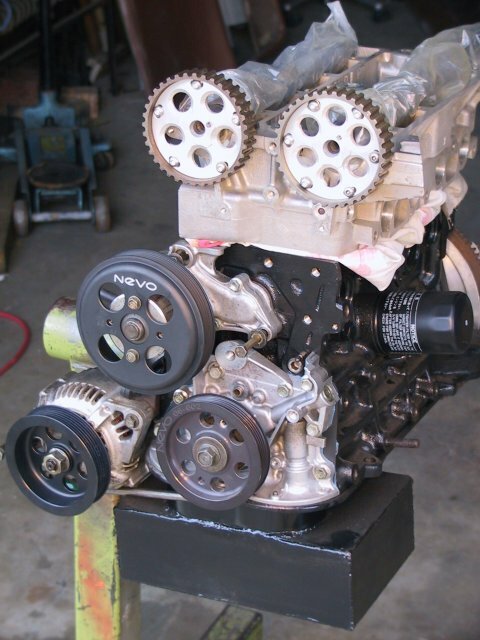 The engine will eventually be getting a heavily modified 7AFE head, but that it going to take quite some time to complete so just to get the car going it's getting a ~185hp 4AGE. 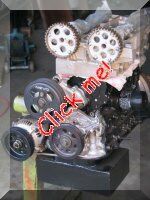 I have virtually all the parts to build one of those, so it's an easy way to get it going. 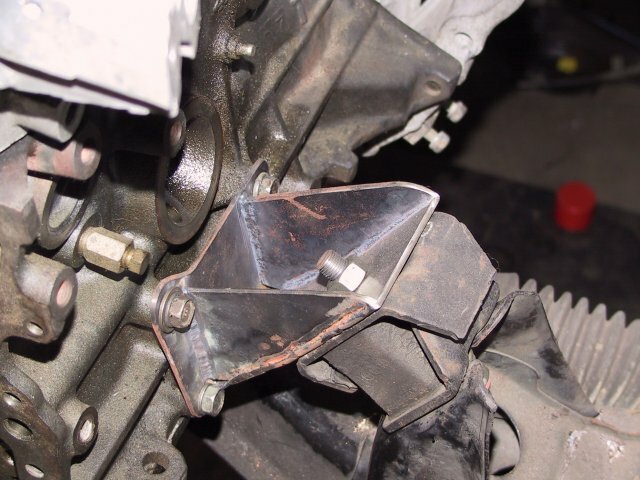 These are the engine mounts that have been made up, and they use the existing KP-61 crossmember, and so the brackets that mount to the engine are hand fabricated. 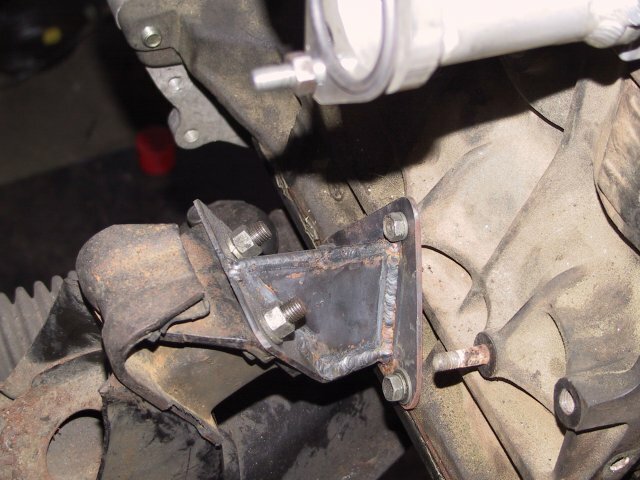 The gearbox mounts are also hand fabricated, and they ended being very nicely made indeed, and almost look factory. One right you can see that the gearbox is just a half casing, to make it lighter to handle. 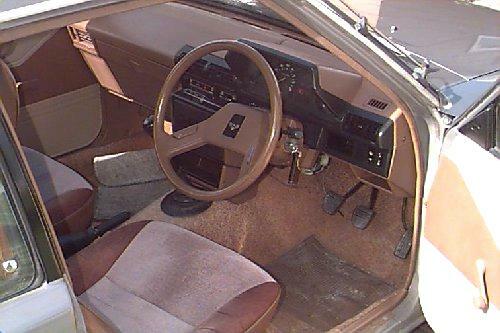 The gearbox is an early model T-50, out of a TA-22 Celica as they have the gearstick sitting a few inches further forward than the more common T-50 that the AE-86's use. 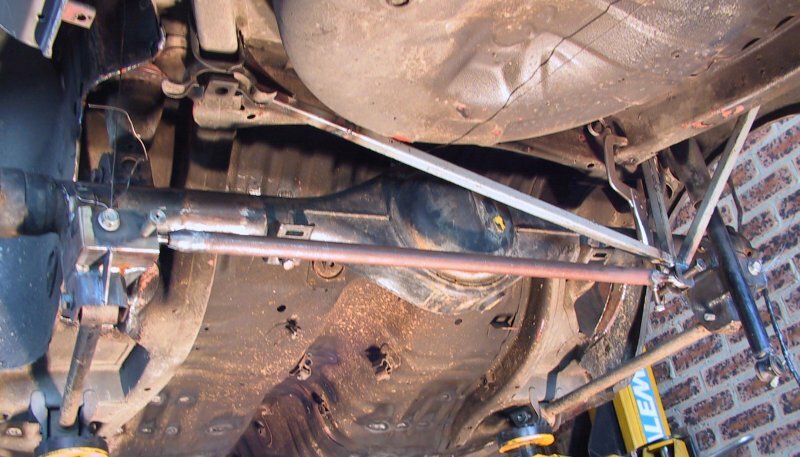 That lets the gearstick stick straight up into the existing hole. 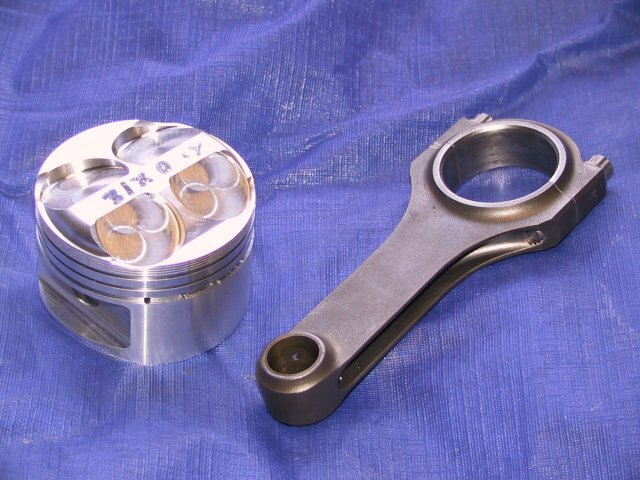 This is one of the forged pistons that I'll be using. 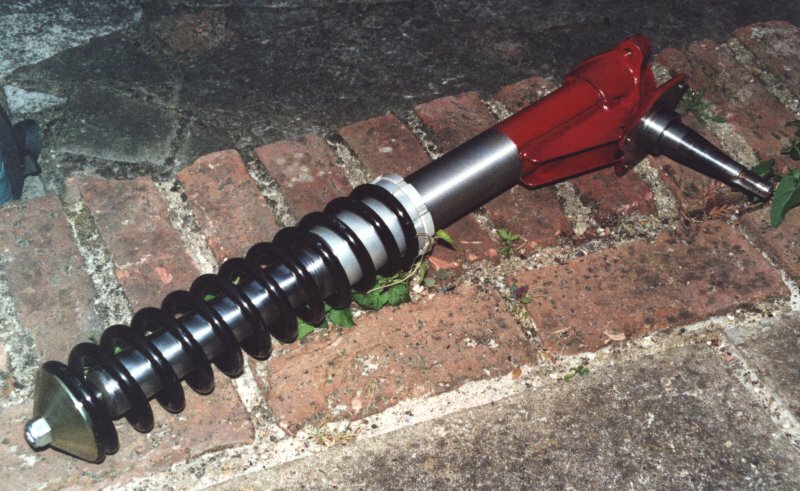 (I ended up using a more standard type of con-rod, and will be saving the good rods for another project) The pistons were bought from RMSport in the UK, and the TRD/Carillo con-rods from a company in the US. 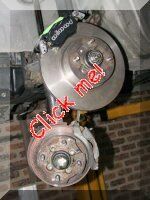 The car should be quite fast, so to make very sure that there wouldn't be any problems stopping I spent a few dollars getting some very good brakes for it. 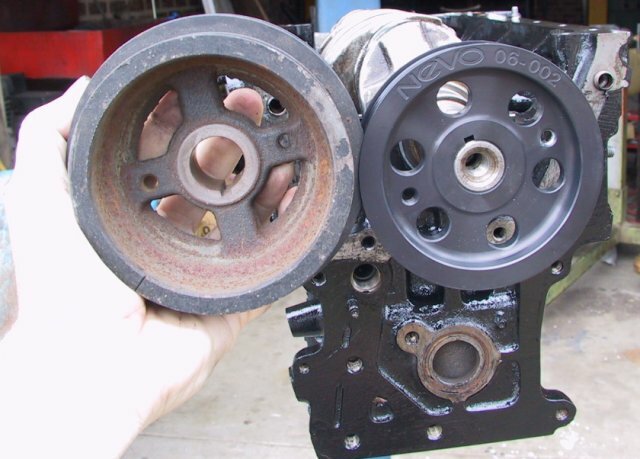 The discs are off the front of a Toyota RAV4, and they only require very small mods to bolt up to the hubs of the AE-86 Corolla struts, pictured on the right. The calipers on all four corners are Wilwod Dynalite four-spots, with Gator Green pads all round. 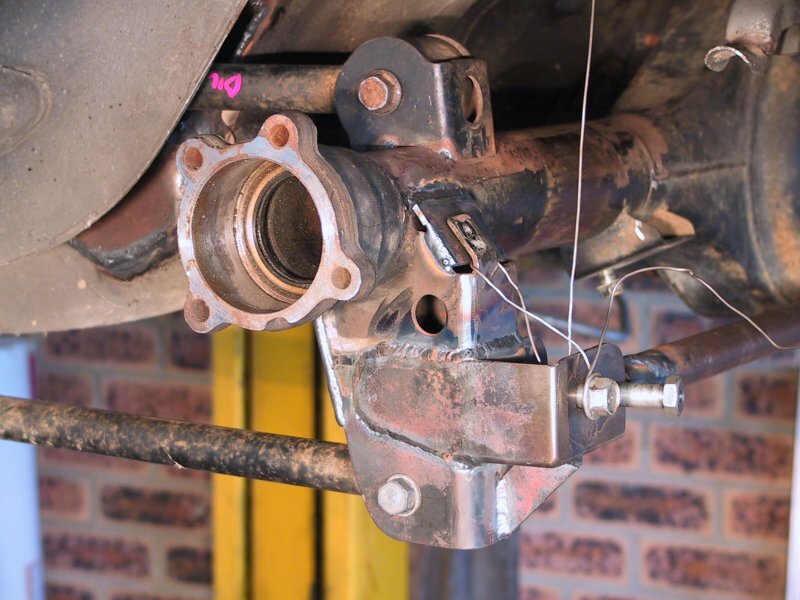 The picture on the left shows the difference in size between the stock brakes and the new ones - no, it's not an optical illusion, they really are that big! That's not the final position for the calipers either, I just sat one there to see how it looked. I haven't finalised the rear brakes yet, but they will be a little smaller. 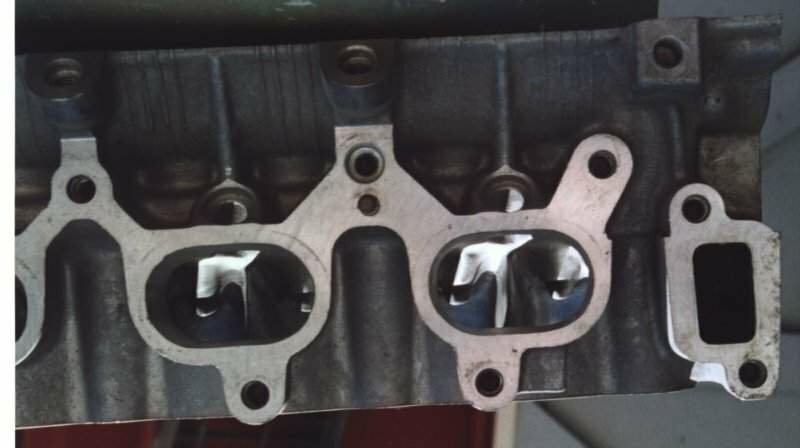 This is the new engine as it's coming along. You can see the polished crank, lightened a little, and also the under-drive crank pulley, as made by John Harris of NEVO. 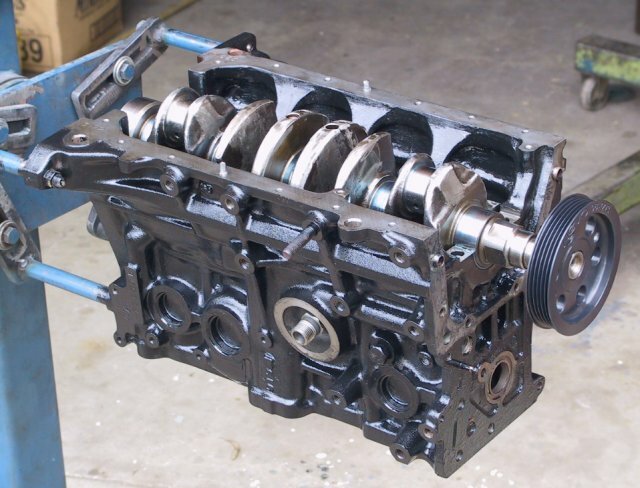 The under-drive pulley helps reduce power losses, as the water pump and alternator do not need to spin as quickly as they do. 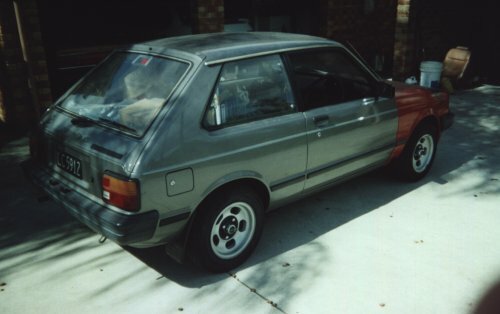 Here's the rear end of the Starlet as the four-link progresses. 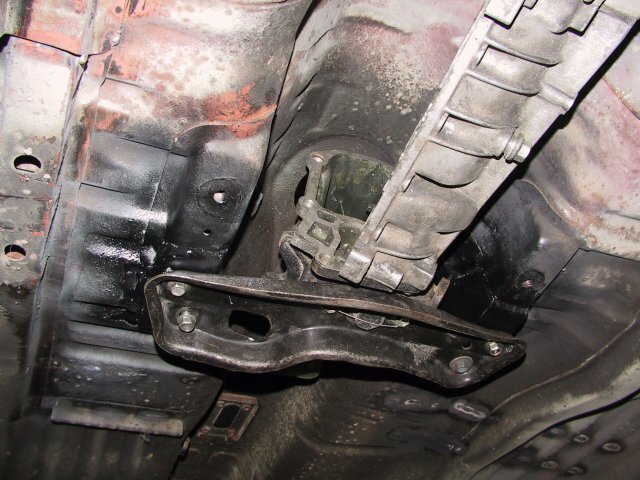 On the left you can see the upper link as it goes into the floor of the car, the left hand end of the panhard rod's mount, and the bottom end of the damper mount. 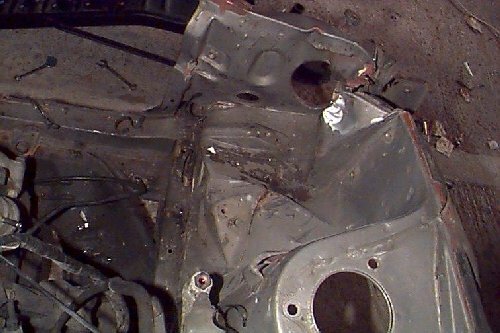 On the right you can see the bracketry for the right hand end of the panhard rod chassis mount. Not much done as I've been out of the country for months with work, but have at least now assembled the bottom end and have dummy-assembled the engine to see how it will look. 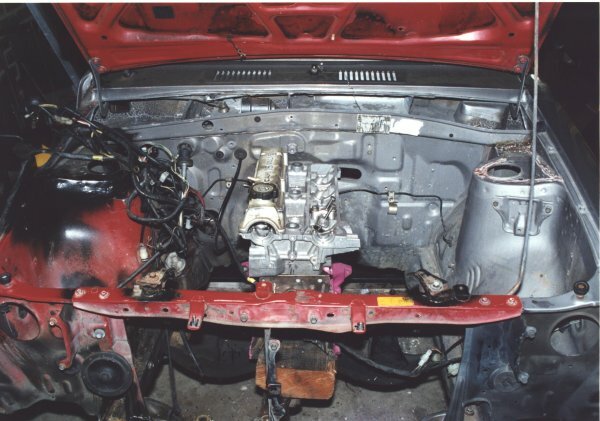 On the left is the engine pretty much as it will be installed in the Starlet. The new cams, still in the plastic wrappers are sitting in the head and fitted to them are the adjustable cam pulleys. Also quite noticeable are the excellent NEVO under-drive fanbelt pulleys. 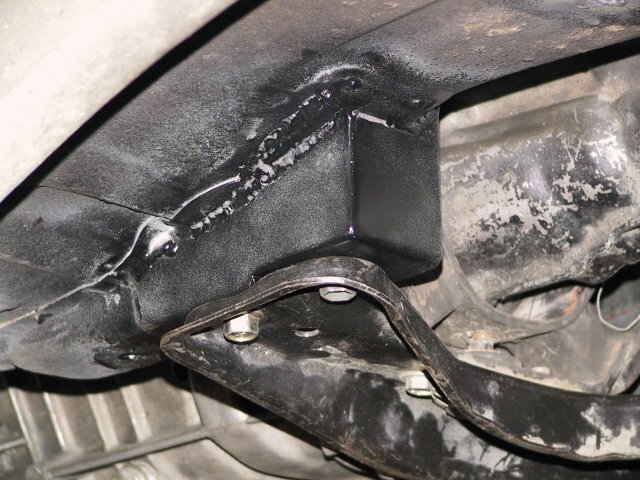 It also has a larger sump & baffles to make it still flow oil under hard cornering. 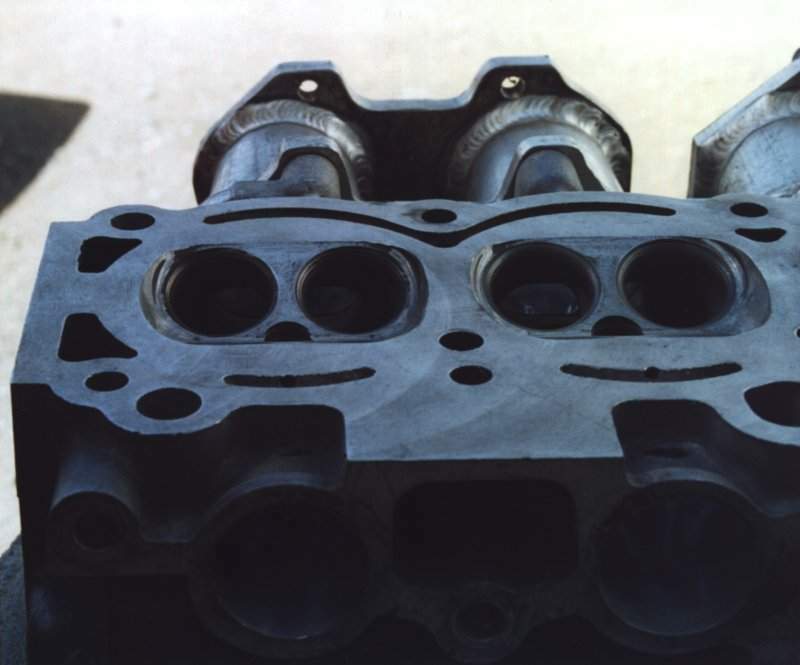 On the right is the same bottom end, but with the 7AFE head that I will be modifying, as described below. 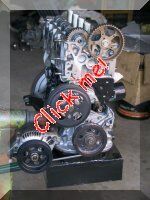 For details of the planned engine for the Starlet, please go here.